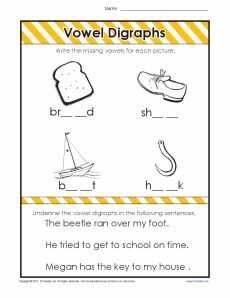 Your young student can practice spelling and phonics in this worksheet on vowel diagraphs. She’ll write vowels pairs for common words, then identify the diagraphs in sentences. The worksheet follows the Common Core Standards for Phonics and Word Recognition for first and second grade, although it may be appropriate for other grades.